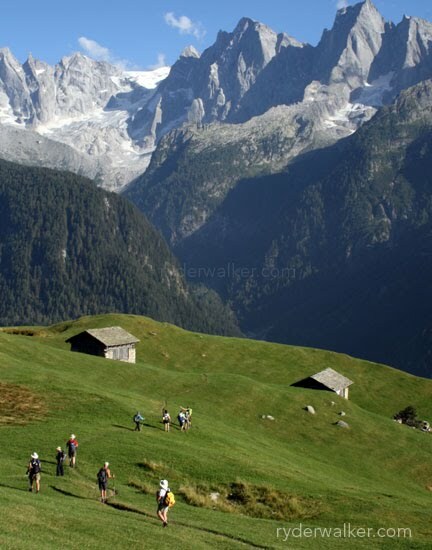 A group of hikers descends a hidden valley in the Swiss Alps. Cowbells tinkle. A goat bleats in the distance. The smell of damp earth and raked hay permeates. A voice rings out from the hillside.”Buon Giorno!” A lone glacier eats away at the earth’s crust. The mountains begin their journey to the sea. Time passes slowly. The hikers continue to descend. Tonight they’ll rest in the tiny village of Soglio, a Roman village filled with tiny alleyways and cobblestone roads. Taken during the Engadine Summit Series. The glacier in the background is called the Bondasca. The mountain range is the Sciora. I think you can see me if you look closely! Thanks for an incredible hike Daniel and Ken, and for such a beautiful introduction to Soglio.